Have you ever gone across the Homestead Grays Bridge (formerly the Homestead High Level Bridge), or driven to the Waterfront and noticed a dozen red brick monoliths towering over the area? Is this Pittsburgh’s answer to Stonehenge? No, it’s The Homestead Stacks, a reminder of our industrial past and how much our workforce and economy has changed in the last 100 years. In the 20th Century, Pittsburgh established itself as a manufacturing dynamo. Steel mills and the plants of other industries lined the banks of our rivers. There were nearly three dozen mills in the area employing thousands of workers. Sadly, The Homestead Stacks are one of the few remaining indications of our illustrious manufacturing past. The stacks were part of the Homestead Works and all that remains of the 45-inch Mill, a mill built during an expansion in World War II to prepare steel for rolling by shaping it into slabs. These stacks were venting stacks and not “smokestacks” as they are sometimes referred to. They were a part of the soaking pits. Inside the soaking pits, the temperature would reach 2250° Fahrenheit, and the venting stacks helped to equalize the internal and external temperatures of the steel ingots before they were sent to the rolling mill. The steel industry collapsed in the 1980s. Thousands of Pittsburghers lost their livelihoods and moved away, and the mills were shuttered. 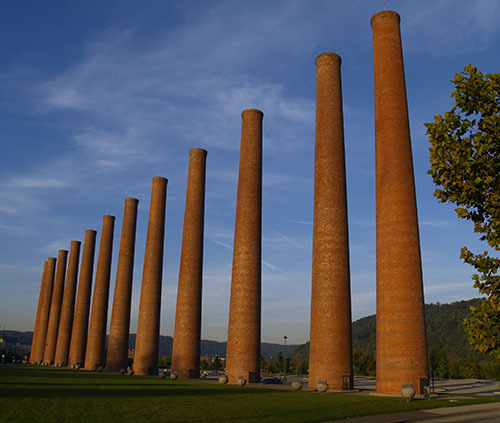 In 1999, mill sites were reclaimed and The Waterfront, a shopping complex in Homestead, was opened, but The Stacks were preserved as a reminder of our past.